Note the term "printing to bitmaps" is used whenever rendering to an image format rather than directly to a printer and does not necessarily mean printing to the Windows bitmap format .bmp. Many other file formats such as jpeg, tif, tga and others are also supported. When printing to bitmaps the user may encounter a "Print error". Such errors are not always easy to diagnose, however some common causes of this problem are listed below. 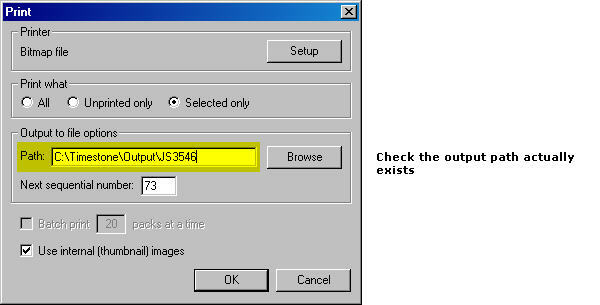 When printing to bitmap files the user has the option to name the files according to subject data (see article File numbering when printing to bitmaps). However this may result in file names exceeding the maximum number of characters allowed by Windows. Currently this limit is 256 characters. To test whether the filenames are the problem try printing using "sequential number" as the naming option. If printing is successful try limiting the amount of data used by the "name" option via the As tags facility as described in the article above. Several characters are not allowed by Windows as part of filenames. These include ⁄ : * ? " < > and ?. Filenames must also not begin with a period. If subject data contains these characters and the "name" numbering option is used, it is possible the filenames attempt to use these characters. Since this is not allowed by Windows a print error results. To test whether the filenames are the problem try printing using"sequential number" as the naming option. If printing is successful try limiting the amount of data used by the "name" option via the As tags facility.